A successful “hot fire” test Friday night is expected to clear the way for the first launch, in just over a month, of a new medium-class launch vehicle. Orbital Sciences Corporation fired the two AJ26 engines in the first stage of an Antares rocket Friday evening, holding the stage down on the pad at the Mid Atlantic Regional Spaceport (MARS) in Virginia. The test, which lasted for 29 seconds, confirmed that the engines and the other systems in the rocket’s first stage worked as planned. 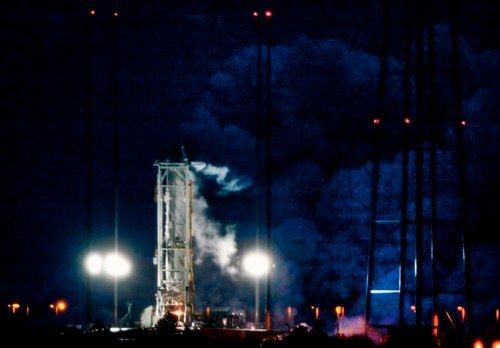 “Our initial assessment of the test data shows that we were successful in achieving each of the primary objectives we had hoped to accomplish going into the test,” said Antares program manager Mike Pinkston in a statement released by the company after the test. More analysis of the data collected in the test is planned for the coming days, but assuming there are no problems, the company will proceed with rolling out the first full Antares rocket for launch in about six weeks, or early April. That launch will carry an instrumented test payload designed to simulate a Cygnus cargo spacecraft. If that is successful, Orbital will launch the first Cygnus mission to the International Space Station, likely in the middle of the year. That flight would be the final milestone in Orbital’s award from NASA under the Commercial Orbital Transportation Services (COTS) program, closing out that program. The other company that developed a launch vehicle and spacecraft under COTS, SpaceX, closed out its award when a Falcon 9 launched a Dragon spacecraft to the ISS last May. SpaceX followed that with the first mission under its Commercial Resupply Services (CRS) contract in October. The second CRS mission by SpaceX is slated for launch the morning of March 1 from Cape Canaveral. This is good news. The Russian derived engines are high efficiency. If you mated these with the SpaceX highly weight optimized first stage of the Falcon 9, you’d get a SSTO.